Homecoming is a special tradition on College Campuses across the country. The origins of homecoming date back to the early 1900’s. It is debated on which school began the tradition but there are records of an Alumni Football game that was played on Northern Illinois University’s campus as far back as 1903! The first time the words “come home” were used to entice alumni back to their alma mater were by the Mizzou athletic director for a 1911 game against rivals, the Kansas Jayhawks. The digital world makes it easier to stay connected with friends once you graduate, but for many, you end up all over the country (sometimes the world) after graduation. You may only see your closest friends every few years at best. Given the opportunity to come together, back to where you met, and catch up is priceless. Use homecoming as an opportunity to catch up with old friends and make new ones! This may not even need a description and reason as to why it makes the list. Tailgating is always fun, especially when you get to be back on campus with family and friends. The food, the games, the memories (both old and new to be made)….need we say more? Okay we know, not every school has a great football program or a football program at all. That doesn’t mean you can’t still have fun either going to the game, watching the game from your favorite old watering hole, or throwing the football around at the aforementioned tailgate. Whatever you decide to do, have some fun with America’s favorite sport. Your home away from home! The best four (or five…or six…or…) years of your life. And what better time of the year to see your lovely campus than in autumn. Hit up your favorite restaurants, the student union and all your old stomping grounds. Yes, that’s right. You’re an alumni now. You’re a big deal. Why not celebrate that status while back on campus? Connect with other past alumni and take advantage of the time to network. 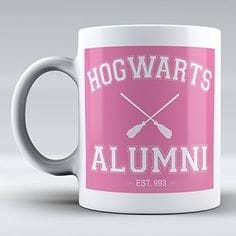 And buying that first Alumni school coffee mug feels pretty awesome too.